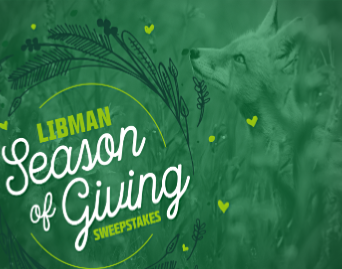 Libman “Season of Giving” Sweepstakes – Win $500! 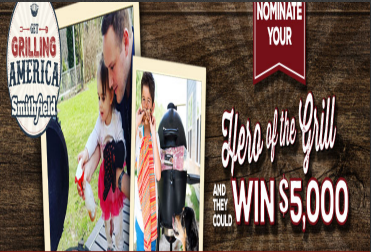 Win $500 for you and a charity (10 winners)! 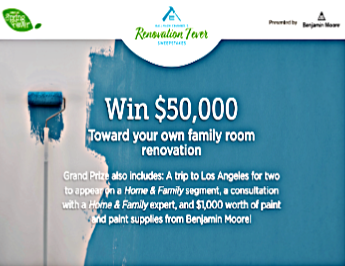 ENTER SWEEPSTAKES HERE – Libman Sweepstakes page. ENTRY LIMIT – One entry per person. ELIGIBILITY – Libman is offering this sweepstakes only to legal residents of the 50 United States and the District of Columbia who are 18 years of age or older at time of entry. 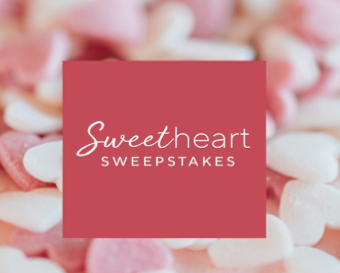 SWEEPSTAKES ENTRY PERIOD – The Sweepstakes begins on November 7, 2018 at 11:30 am EST (“Eastern Standard Time”) and ends on December 12, 2018 at 11:30 am EST. PRIZES – If there are sufficient entries, Libman will award 10 prize winners $500 each in Visa® gift cards and $500 to the charity selected on the entry form on behalf of each winner. 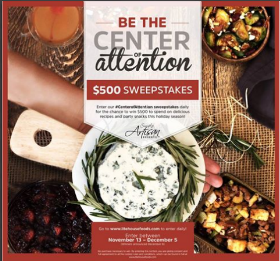 Litehouse Foods “Center of Attention” Sweepstakes – Win $500! ENTER SWEEPSTAKES HERE – Litehouse Facebook Sweepstakes page. SWEEPSTAKES ENTRY PERIOD – The Promotion begins at 09:00:01 Pacific Time (“PT”) on November 13, 2017 and ends at 23:59:59 PT on December 5, 2017. 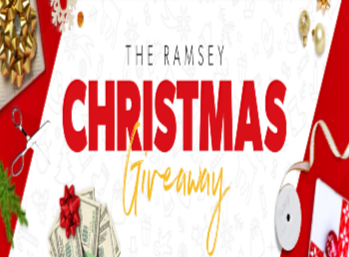 PRIZES – One winner will receive $500. 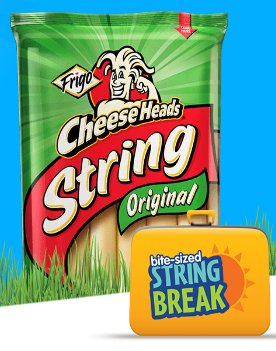 Frigo® Cheese Heads® “Bite Size String Break” Sweepstakes & IWG – Win $500! ENTRY LIMIT – One (1) Game Play per person/per email/per day during the Promotion Period. ELIGIBILITY – Promotion is open to all legal US residents physically residing in the 50 United States and District of Columbia who are at least 18 years of age or older at time of participation, and have reached the age of majority in their state of residence. SWEEPSTAKES ENTRY PERIOD – The Saputo Cheese USA Inc., Frigo® Cheese Heads® “Bite Size String Break” Promotion starts at 10:00:00 AM Central Time (“CT”) on January 3, 2017, and ends at 9:59:59 AM CT on March 13, 2017. 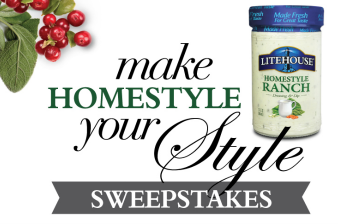 Litehouse Foods “Make Homestyle Your Style” Sweepstakes – Win $500! ENTRY LIMIT – One entry per Facebook page will be awarded during the promotion. ELIGIBILITY – The Promotion is open only to legal residents of the United States (excluding Puerto Rico and any other U.S. territories) who are 18 years of age or older and have reached 18 years of age in their state as of December 1, 2016. 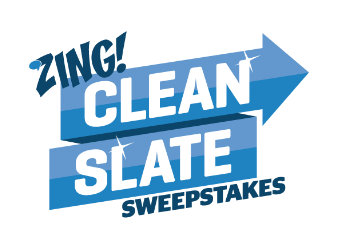 SWEEPSTAKES ENTRY PERIOD – The Promotion begins at 12:00:01 Pacific Time (“PT”) on December 16, 2016 and ends at 23:59:59 PT on January 1, 2017. 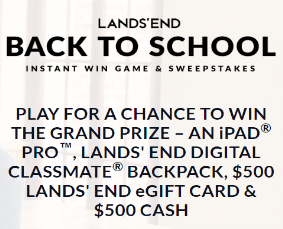 Lands’ End Back to School Sweeps & IWG – Win $500 & more! Win $500 spending money, a $500 Lands’ End gift card, an iPad Pro & more! ENTRY LIMIT – Limit of one (1) Sweepstakes Entry per person, per email address, per day throughout the Promotion Period. Limit of one (1) Instant Win gameplay per person, per email address, per day throughout the Promotion Period. ELIGIBILITY – The Promotion is open to legal residents of the 50 United States (excluding Puerto Rico) at least 18 years of age (except Alabama and Nebraska, 19, and Mississippi, 21) at the time of Promotion registration; and Canadian residents (excluding Quebec), that have reached the age of majority in the Province in which they reside by the start of this Promotion. SWEEPSTAKES ENTRY PERIOD – Lands’ End Back to School Sweeps begins at 9:00:00 AM Central Time (“CDST”) on July 14, 2016 and ends at 11:59:59 PM CST on August 31, 2016.